Thanksgiving Eve is known in bartender circles as Black Wednesday for being the busiest drinking night of the year (sorry, New Year’s Eve). On Wednesday, November 21st, thirsty Angelenos will be able to enjoy tasty libations and also support one of the city’s most vital nonprofit organizations. Seven Grand and Wild Turkey are teaming up for a Thanksgiving Eve Bash to support The Midnight Mission (TMM), which offers a way to self-sufficiency for men, women and children that are experiencing homelessness in Los Angeles. Located in the Skid Row area of downtown LA, the privately funded organization provides free services that include basic subsistence, a 12-step recovery program, Project Safe Sleep, education, job training and placement. 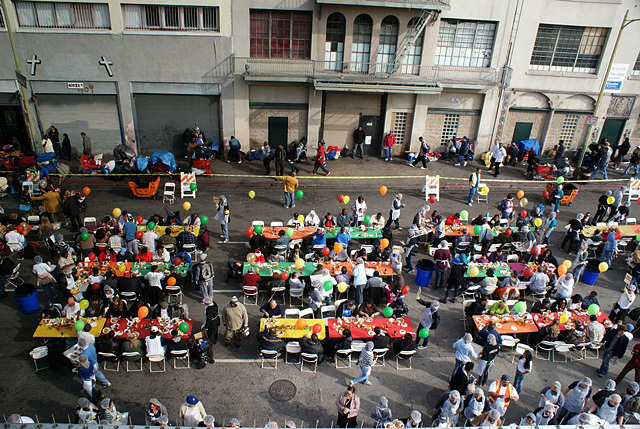 One of TMM’s signature events takes place on Thanksgiving Day, when over 250 volunteers prepare and serve a traditional Thanksgiving dinner to thousands of homeless and near-homeless men, women, and children. Beginning at 5pm on November 21st, a Wild Turkey Spiced Cranberry Punch Cocktail will be featured at Seven Grand all night for $6, which includes a raffle ticket. Every $1 donation to The Midnight Mission for Thanksgiving Dinner will also receive a raffle ticket. Winning tickets will be chosen every hour and special prizes will be given out. For more information on how you can help The Midnight Mission via online donations, donated goods and volunteering, please visit www.midnightmission.org/help.asp. 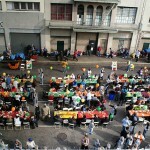 Photo of Thanksgiving Day via The Midnight Mission Facebook page.